It's quite clear this German band is made up of willing musicians as well as it's evident they can blend well even if they come from different musical territories, being such a different "descent" the official explanation of their diversified style. Normally the circumstance of causing troubles to people suffering from that kind of obsession which compulsively urges themselves to file records or bands within watertight compartments should be something to be proud of, but Dust Of Everyday looks like just juxtaposing wav, gothic, rock, metal and pop without really experimenting any original mixture, so that they sound too staid. My impression could be considered a nonsense, as most of bands which melt together different genres sound so cool and interesting, but mixing genres doesn't automatically implythat such a mix could sound really fresh. By the way, premises are interesting as tracks such as Tomorrow or Afraid To Breathe, even if they could remind something else, show a valid approach to melodies and a discrete skill in emphasizing sound, but if you keep on listening, some tracks could appear too hesitating and excessively related to traditional American ballads or hard rock, whose prominence absorbs the relevance of some worthy proof of talent by single members of the band, but when they manage to wander off from such musical subjects, they look like quotist or even plagiarist. For instance, Stranded could be a very good song, thanks also to the delicate female voice by Nadine Kriegs, till the moment when the listener will easily identify DOE sometimes ride on Depeche Mode or Pink Floyd's intuitions. Even if they finish their album with a track entitled Requiem (whose very good refrain made the one I liked more on the whole album), I'd prefer to wait future releases to shape my peremptory opinion on them, as the continue changes of line up and the prolonged time during which this band dwelled on recording could have been hampered on a nimbler development of a more "personal" style. Here we are to review the latest two releases of the Mz. 412 reissue program. Specifically, we're talking about DOMINE REX INFERUM and INFERNAL AFFAIRS. The first of the two originally was released back in 2001 and contained three long suites: "Invok: Satha 412.71", "Ritual: Summ Nv 41:2" and "Komuni: Disciple 824.9 KX". Into this reissue we have two extra tracks enriching the CD: "Uhk Khatark" (track based on digital drones / pulsing noises and treated vocals) and "Sekarth Una Nejadd" (track based on industrial percussions / chants / drones / industrial noises / subtle melodies). The album opens with industrial feedbacks just to leave the place to a disturbing orchestration made of strings, percussions and warbling vocals. "Ritual: Summ Nv 41:2" originally was a 41' suite which on this reissue has been split into six parts. The first one starts slowly with low drones which later are joined by drum percussions. Second and third parts are based on the same elements but things change with the fourth part, which is a slow rumbling dark ambient track with drones and vocals. Fifth part is the most industrial of the lot and the sixth closes the suite with drones. "Komuni: Disciple 824.9 KX" industrial blasts close the original recordings. I can say that this is the album I prefer less. Five years after Mz. 412 released, always on Cold Meat Industry, one of their masterpiece: INFERNAL AFFAIRS. Since from the opening "Preludiumh" and the following "Infernal Affairs I", the listener can realize that things get serious thanks to militaristic percussions and orchestral epic melodies. These ones are a warning that war has just begun. With the following "Vredens Skvadron" and "Point Of Presence", industrial noise is on the run, while "Lord, Make Me An Instrument Of Your Wrath" is an orchestral infernal masterpiece with blasts and noises. The drones of "Epilogh" and "Inkant 12 SLE" prepare the audience for the tension peak of "Unhealing Wounds", a great track made of vocal field recordings, percussions, tiny melodies and grinding noises. Industrial noises and epic orchestrations are the main elements of "Mourning Star" and "Infernal Affairs II". "Postludiumh" closed the original edition of the album with a sort of industrial spoken word but, on this Cold Spring reissue, we have two bonus tracks: "Wounds Of A Fallen Warrior" (a sort of "Postludiumh" second part) and "Overthrowing European Christianity" (a perfect tune for an Uruk-hai attack scene). The last year I reviewed "Bits & Pieces ", the first solo album by Bozzwell that went out for Firm Records. I really dug that album but I've never been able to check the project he has with Nick Eastwood called Hiem. THE ESCAPE FROM DIVISION STREET, their first album released for their own label Startalk International Records, is the perfect occasion to check them. The twelve tracks of the album are a well balanced mix of nu-disco, electro and dance. If you love 4/4 rhythms and hard beats you'll gladly want to find a moment to spin this CD as, since from the opening song "Freaky Nights", you'll realize that the Sheffield duo is able to catch your attention immediately. The opening tune and "Mutual Feeling" are two electro tune with a retro flavor (Holy Ghost! did something similar on their self named album released by DFA recently), while the second one is a great catchy electro dance song that has Phil Oakey (yes, the one and only Human League singer) on guest vocals. "Dj Culture" has the rapper Roots Manuva on vocals and it is a nice mid tempo with syncopated bass lines. "Electricity" is another great tune that will please the lovers of cool melodies and crispy sounds. I also enjoyed the attitude to mix new wave atmospheres with dance sounds and if you already checked the newest Digitalism single and album, you know what I mean. The whole album is full of great moments and beats and it contains also a particular spoken word on "Lemons & Limes" which along with the synth bleeps and pads sounds really cool. 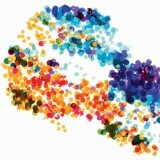 THE ESCAPE FROM DIVISION STREET is the first Startalk International Records release but if this is representative the music they'll release, be sure to follow them. After ten years of activity, what's more marked by many more or less groundless charges of fascism and misogyny, that helped him to build a certain notoriety as a controversial character of the scene (a not so bad aspect in some music territories), supposedly based on the themes he dissects in songs' lyrics, mainly concerning violence and other brutal aspects of human nature - those kind of matters which some hypocritical orthodox thinkers still consider disgraceful, but it's not my purpose to write an essay about false moralism on this column... -, Karloz Manufactura serves his typical musical dish, ironically - and iconically! - portrayed by some plucks adorned and pierced by razorblades in an elegant cocktail glass (small flag or umbrella toothpicks are obsolete...and it's quite funny Rustblade decided to include in the limited edition box set of this "best of" a razorblade as well! ), consisting of an extract from his repertoire, carefully selected together with his (damned) supporters, whose suggestions have been taken into consideration for tracklist. The Janus-like aspect of Manufactura, who's able to alternate ferocious electronic and EBM beat storms with more melodic moments - it seems he musically tries to heal the wounds caused by himself through his music! -, resurfaces from this selection so that amidst really violent fits of temper (I particularly liked the initial Killing You, perfect as a warm-up track, the rumshackle stompers The Divine Discontent and Open For Pleasure, the cinematic Defile the Chastity Of Your Flesh...I'm pretty sure they could become hits for trained darkish dancehalls), you'll find some moments of relative truce and contemplative melodies, such as the epic Die For Me, the Beefcake-like electro-industrial of The Saint Of violence (one of the two previously unreleased tracks included in this issue), the electric formaldehyde of Deep Waters (Ophelia's Descent Mix), sung by Brittany Bindrim (from i:scintilla), the entrancing synth-pop of The Whore's Lullaby, which are definitively my favorite ones. If you never heard Manufactura's music before, consider The pleasures Of the Damned the possibly best starting point for sure, if you don't get scared or disgusted by the cover artwork - the most romantic image possible for a grindcore fan by the way!!! -. 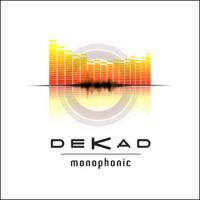 Three years ago I reviewed Dekad's second album "Confidential Tears" and now it's time to check their latest one titled MONOPHONIC. Passed from a trio to a solo project of JB Lacassagne, Dekad didn't lose their distinctive mix of electro e.b.m. and synthpop that was already into "Confidential Tears". On the eleven songs of MONOPHONIC I still hear echoes of late 80s Depeche Mode, Evils Toy or Covenant but JB knows how to tweak things up and he kept these sounds only as reference and sound-wise he opted for analog sounds instead of the cold synth 90s sample based sounds. In this way the bleeps and fat bass lines he used on tracks like "Hands Over Me", "So Sorry" (song enriched by the guest vocals of Lover_XX a.k.a. Sylvie Billy, singer of Foretaste) or the following "What If" (on this one Member U-0176, singer of Celluloide, is on backing vocals) are really making the difference by warming the atmosphere and giving to the whole tracks a crisp sound. We all know that love relationships are hard to deal with but the pain and suffer JB sings about find a comfy place to rest thanks to these sounds.